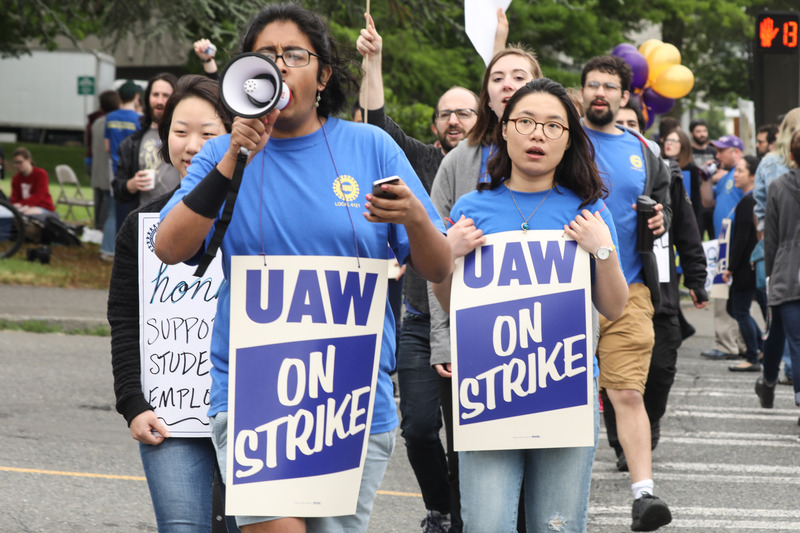 Students march across the intersection of Pend Oreille Street and Montlake Boulevard NE during one-day strike with graduate students who are represented by UAW Local 421 at the University of Washington in Seattle, May 14, 2018. No! No Fees! No Fees to Work! 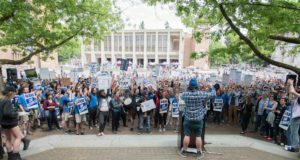 Last Tuesday, 4,500 Academic Student Employees (ASE’s) at the University of Washington (UW) campuses in Seattle, Bothell, and Tacoma courageously went on a one-day strike after working for months without a contract. The university administration had failed to meet even the very basic and reasonable demands of the student employees. The UAW Local 4121, the union representing the graduate research assistants, teaching assistants, pre-doctoral instructors, readers, graders, and tutors at UW is demanding a living wage for the thousands of workers. The backdrop of Seattle’s skyrocketing rents and affordable housing crisis is fuelling the fighting spirit of the union, with workers carrying signs saying “80% of ASE’s are Rent Burdened” and “We can’t teach if We can’t pay rent.” Even as UAW fights for a better contract, their members have also been on the forefront of the recent historic victory of the citywide movement to tax Amazon and other big businesses to build social housing – publicly funded permanently affordable housing. The UAW strike action is part of a new period of struggle by public sector workers against brutal austerity and draconian cuts to education and social services, and the larger fight against the billionaire class. Starting with the successful nine-day strike action by the West Virginia public school teachers and other employees, the fight has spread to Oklahoma, Arizona, and we are now seeing some rumblings in Washington state. At the rally during the strike action, UAW members pointed out out that they are among the tens of thousands of faculty, staff, and students whose creativity and dedication makes UW a campus with a world-class reputation. With the majority of UAW members scrimping on food and other necessities, it is shameful that UW has failed to offer a decent contract. The university, with its staggering $3.36 billion endowment, absolutely has the money to raise pay and expand benefits. Instead, it’s part of the story across the country: UW has steadily raised tuition on students while reducing tenured faculty, and stubbornly fighting for pay cuts for UAW, SEIU, WFSE, and other workers on campus. The union is demanding an end to fees for academic student workers, which is akin to wage theft. They are also demanding UW address the pervasive workplace sexual harassment on the campuses, with anti-discrimination trainings, departmental equity committees, and strengthened protections for all workers from discrimination and harassment. They are also demanding health benefit equity for their trans members. In the era of #MeToo, when women all over the country are speaking out against workplace sexual harassment, it is unacceptable that UW has rejected these modest proposals to ensure equitable treatment. The UAW has some experience fighting back: they’ve gone out on strike before – and won – and have been part of the the fight to make UW adopt a $15 an hour minimum wage. With the successful teacher uprisings happening across the country showing the way, it’s clear that the grad students are fired up. Seattle City Councilmember, Socialist Alternative member, and AFT Local 1789 member Kshama Sawant has been supporting the grad students in bargaining actions that led up to the strike. At the rally during the one-day strike Kshama gave a rousing speech, and when she said “socialists are here with you,” hands shot up throughout the crowd from workers and supporters identifying as socialist! As it has become more clear that the workers will have to go back out on strike, Kshama led the fight on Seattle City Council to unanimously pass a resolution calling on UW to bargain a fair contract with UAW. Her office then sent a letter to the UW President. Many campus unions – SEIU, WFSE, IBEW, Teamsters, plumbers and pipefitters, and others – honored the UAW picket line by refusing to cross the lines and do work, showing what true worker and labor solidarity looks like. With solidarity in the labor movement, and among workers in general, we can push back against the bosses and the status quo of inequality, and we can win. Union locals across the country should stand up and support the UAW 4121 strike, sending messages of solidarity. Socialist Alternative will continue to walk the picket line and stand with these workers, because an injury to one is an injury to all.